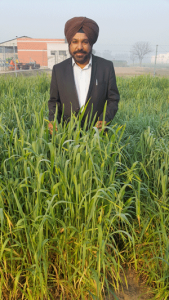 A pillar for global food security, wheat provides 20 percent of the protein and calories consumed worldwide and up to 50% in developing countries. A 2015 World Bank report showed that, without action, climate change would likely spark higher agricultural prices and threaten food security in the world’s poorer regions. SeeD is a joint initiative of CIMMYT and the Mexican Ministry of agriculture and rural development (SADER) through the MasAgro project. SeeD receives additional funding from the CGIAR Research Programs on Maize (MAIZE CRP) and Wheat (WHEAT CRP), and from the UK’s Biotechnology and Biological Sciences Research Council (BBSRC). SeeD works to unlock the genetic potential of maize and wheat genetic resources by providing breeders with a toolkit that enables their more targeted use in the development of better varieties that address future challenges, including those from climate change and a growing population.